a name she picked up in school. Elizabeth admires Nai'Be's dress. Nai'Be says she learned to sew in school. Elizabeth says J.B.
business from Clay and apparently will be taking Nai'Be with him. They arrive at Shiloh where Holly has the guest room all ready for her. them, we find out the two men work for a rancher named McKinley. but regrets that she learned and spoke only English, not Shoshone. tells her they must "learn from the Whites...how to survive." Nai'Be replies, "How? As Indian? 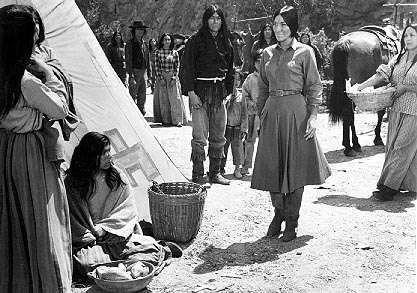 As Shoshone?" The next morning Holly remarks to Clay that Nai'Be seems "different...troubled." two cowboys who make ethnic slurs about J.B.'s background. regretfully says that McKinley went over his head and wrote to Washington. soon by going through the Shoshone village "if it's still there." Meanwhile, the Virginian and Trampas are herding the Shiloh cattle and J.B.
go with them to the reservation after all. She needs more time to think. reservation tomorrow. The Virginian says she may not be going and J.B.
says he's not surprised. He thought there was something wrong. "chomping at the bit" to get back to the reservation. Later that evening, Nai'Be is reading a book from Clay's library. faced the same problem themselves." Clay replies, "He's probably right. People don't change. Only the world they live in changes." She asks, "Don't you think when the world changes, it changes the people in it?" kitchen afterwards, Clay and Holly are discussing the situation. maybe she should return to the reservation. her mind and wants to go to the reservation at least for a little while. "Have I seemed ungracious?" she asks. "No," Clay replies, "honest!" unsuccessfully trying to keep him from going through the Shoshone village. by Nelson who tells them of his frustration in trying to ease the situation. sea of Indian faces as she has now truly returned to her homeland. and Nai'Be to help the children." and pet us like the dogs you keep?" "Before there was joy in you, laughter. Now you are troubled." She disagrees, saying that it gives her great pleasure to see him. things he cannot understand and I cannot make him understand." "Perhaps he sees you as changed," answers Den'Gwatzi, "I do not. To me you are the same, holding my hand, asking questions, laughing. The joy is still in you. You must find it again." you were away, about the day you'd return and we'd start our life together. she was, she's trying to find out who she is. "Can't you see, June Bear? they wished. They told us our world was dying and we believed them. They said 'choose between our life and your death' and we chose. an expression of regret for having done that. wrong, June Bear," she replies. who is trampled trying to save her daughter, Dah'Bu'Tzi. At Pa'Guichap's graveside, J.B. says they can take Dah'Bu'Tzi home. J.B. (carrying Dah'Bu'Tzi) and Nai'Be crossing the river to their new home. "An Officer and a Gentleman" in 1982.